Write new family stories with the 2019 Starcraft Launch Outfitter 21FBS! Find this Travel Trailer and other top quality RVs at RV World MI! With our low prices and high RV expertise, we're one of the best RV dealerships in Michigan! 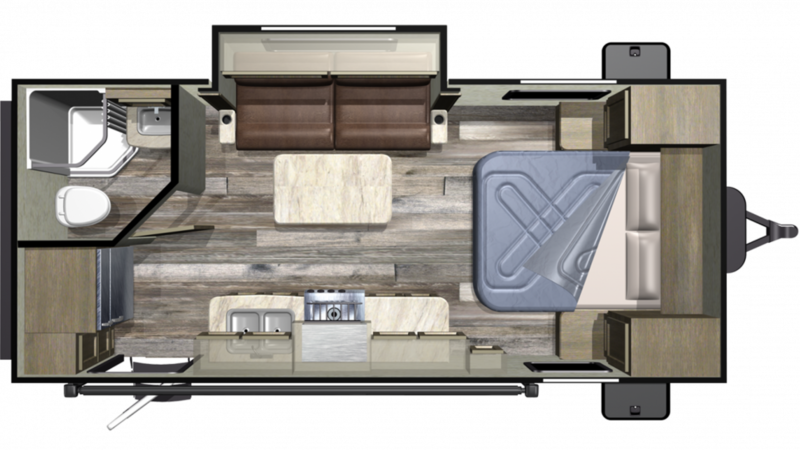 Stop by our lot at 7834 S Division Grand Rapids Michigan 49548 to take this model home, or talk to one of our RV experts at 616-591-3632 for more information! Is your destination on the other side of the country? No worries! This reliable RV is quite easy to tow, with a ship weight of 4070 lbs, hitch weight of 370 lbs, and a GVWR of 4900 lbs! Once you've finally made it to your campsite, pull out the 12' 0" awning with ease for some much-needed shade and protection! Eating out on the road can be expensive - and fattening! That won't be a problem thanks to the super kitchen inside! With its 3 burner cooktop and handy 6.00 cu. ft. refrigerator you can stock all your favorite, healthy foods, and cook them up anytime! Enjoy clean water throughout the trip, thanks to the 29 gallon fresh water tank! You don't have to survive solely on campfire food and fast food joints! With the kitchen's 6.00 cu. ft. refrigerator and 3 burner range cooktop, there's plenty of different options for breakfast, lunch, and dinner! With the 29 gallon fresh water tank, you won't have to worry about running out of clean water!